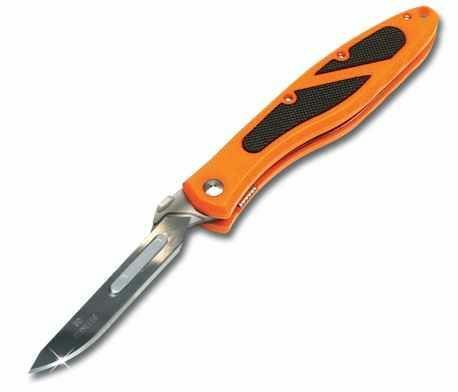 The Havalon Piranta Edge is one of the most popular hunting knife alternatives these days. We call it an alternative because it cannot be considered an actual knife, at least not in the traditional sense of the word, seeing how you can replace the blades and they look like something taken out of a TV show like House M.D. or E.R. This option is definitely not an all-purpose knife that you can use in a plethora of situations, so it won’t help you if you have to build a fire, for example. On the other hand, it is one of the most effective choices for tasks such as field dressing or skinning the animal you have hunted. It does come with several features you should definitely consider before deciding whether this makes a suitable choice for the type of hunting you engage in. Let’s look at some of the things that make it so popular among hunting enthusiasts. One thing you definitely do not have to worry about with this knife is performing any sort of maintenance practices in order to maintain the edge and sharpness of the blade. Since this one comes with removable blades, you can simply throw the dull one away and replace it with a new one, therefore making sure that you skin the animal in an effective manner. Of course, almost no other hunting knife dulls after just one use, but this one is undoubtedly convenient in this respect. Also, note that the blades are small-sized, so there shouldn’t be anything stopping you from carrying a dozen with you in your backpack, for instance. The overall length of this product is 7.25 inches, so it’s not the biggest one ever to have seen the light of day. However, due to its ergonomically molded handle, you can surely hold it comfortably in your hand whether you have smaller or bigger hands. The easy grip black rubber inlay design boasted by the handle is another aspect worth writing home about since it allows for a proper fit and an enhanced degree of comfort. All in all, the size of this particular handle makes it a great choice for most backcountry hunters out there. Another aspect worth considering and that makes the difference between the Havalon Piranta Edge and some of its competitors is the fact that this unit is outfitted with a proprietary liner-lock design. 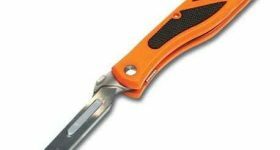 This feature has been specially engineered so as to add further rigidity and assure the user that he or she can rely on this knife for as many hunting seasons as possible. While some might argue that the bright orange design of the handle is an inconvenience since you won’t be able to blend into the hunting environment, the truth is that it makes the item easy to spot among the rest of your gear. In case you drop it on the ground, you’ll have no trouble identifying it through the weeds. If you decide that carrying this knife in its own sheath isn’t something you want to do, you can rest assured that you can simply do so in your pocket since the Havalon Piranta Edge comes with a convenient pocket clip. What about usability? To put it simply, that’s an area where this product really shines since it weighs in at just 2 ounces, which means that it is among the lightest models in its class. It is the perfect alternative for a weight-conscious hunter and its size also recommends it if you want to make sure that you don’t pick gear that takes up a lot of room in your backpack. What gives a cutting edge to this knife is the fact that you can replace its blade with ease and in as little time as possible. The surgical blades are effective and sharp and they won’t fail to provide you with the performance you require especially when it might be critical. The truth is that, while it might not be a typical choice, it is a dependable one since you will never be without a knife that is razor-sharp and that is perfectly capable of serving you. Finally, the fact that this unit is shipped with twelve additional stainless steel blades as well as a sheath is another aspect that you ought to bear in mind. Last, but not least, we’d like to note that the Havalon Piranta EDGE is backed by a 100% satisfaction guarantee. We advise you to get in touch with the brand’s customer service representatives for any issue you might encounter.